The inauguration of Governor Nasir El-Rufa’i of Kaduna State ended abruptly on Friday after angry youth pelted some prominent indigenes of the state, including the revered Emir of Zaria, Shehu Idris, and the state chief judge, Taminu Zailani, at the venue of the inauguration. The rampaging youth accused them of colluding with the previous administration of Governor Ramalan Yero to plunder the resources of the state. They specifically demanded the dethronement of the Emir who in the ensuing pandemonium that enveloped the venue of the inauguration was rescued and smuggled out of the venue by his palace guards. A senator-elect, Shehu Sani, used his car to smuggle the chief judge out of the venue. He then drove him to his home in the Riga Chikun area of Kaduna. 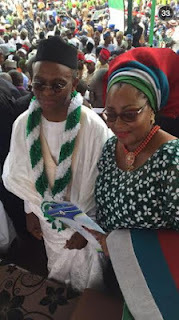 Mr. El-Rufai could not review the parade mounted by the police as some youth pelted dignitaries with water in sachets, stones and other objects in the pavilion. This prompted security agents to fire tear gas into the crowd at the Murtala Square, Kaduna. 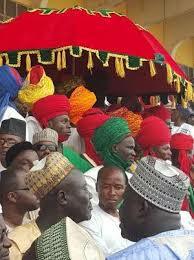 Some dignitaries in the pavilion included the Emir of Zazzau, Shehu Idris, and other traditional rulers in the State. The incident occurred when the new governor had concluded his address and was about to mount an open van to review the parade mounted by the police. While the crowds were dispersed by the police, dignitaries remained seated, but the occasion ended abruptly without the governor reviewing the parade. The Murtala Square was filled to capacity.